Will Oil Find Support Above $50? - Technical Traders Ltd. - Investment Strategies, Analysis & Intelligence for Seasoned Investors. 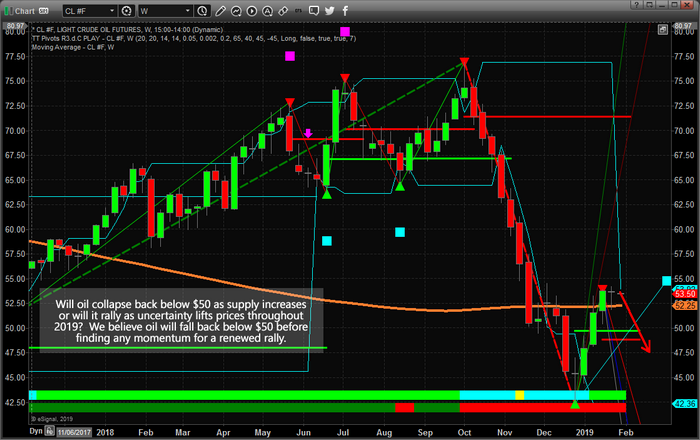 Technical Traders Ltd. » Will Oil Find Support Above $50? Recent global news regarding Venezuela, China, and global oil supply/production have resulted in the price of Oil pausing over the past few weeks near $53 to $55 ppb. We believe the continued supply glut and uncertainty will result in oil prices falling, briefly, back below $50 ppb before any new price rally begins. Our researchers at www.TheTechnicalTraders.com believe historical resistance near $54~55 is strong enough to drive prices lower before new momentum picks up for a renewed price rally. Eventually, yes, oil will rally above $55 and attempt to target the $65+ price level. Yet we don't believe that move is going to happen right now. We believe the global uncertainty; the slowing Chinese economy and the global supply glut will result in a fundamental price decrease before any momentum for an upside price move begins. Our analysis suggests a price move back below $50 ppb, likely targeting the $46~47 level, where basing may occur. Uncertainty in Venezuela and other oil-producing nations may result in a disruption in supply at some point in the future. We must be cautious of unknown situations that could result in dramatic price shifts. Yet, overall, with supply levels still high and slowing global economic expectations, it makes sense that oil would attempt to base and find support near recent lows – between $46~48. Visit www.TheTechnicalTraders.com to learn how we can help you find and execute better trades in 2019. Learn how our proprietary predictive modeling systems have called these moves in the past and how our research team can assist you in finding great opportunities in the future.